There are five friendly piglets for young children to meet as they search for the right pig in this fun touchy-feely board book. Little fingers can enjoy exploring bumpy trotters, smooth tails and soft ears as they find a new piglet on every page. Bright, colourful illustrations and simple, repetitive text are combined with carefully chosen textures to touch and feel on every page. Winner of the Sainsbury's Children's Book Award (Baby and Toddler category). Bright, colourful illustrations and simple, repetitive text are combined with carefully chosen textures to touch and feel on every page. Great fun to share together – and don’t forget to spot the little white mouse on every page! Winner of the Sainsbury's Children's Book Award (Baby and Toddler category). Sainsbury’s invited all their current children’s book publishers to nominate up to two books for each of the award categories. Phil Earle, children’s author and judge commented on the Awards saying: "There was such talent on show in the books submitted, I’ve no doubt the shortlisted titles, and indeed the winner, will delight our most discerning readers, children!" 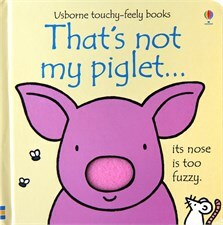 This year’s offerings from Usborne’s That’s not my... series includes goats and foxes but it’s the piglet one that delights the most, with its lovely touchy-feely pages and great illustrations. An absolute joy... sure to become another favourite.